Description: Solem & Associates award-winning public relations and public affairs firm was throwing their 30th Anniversary party. 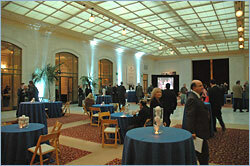 The event was to be held at the historic San Francisco City Hall. Working with a reputable audiovisual company that understands the importance of the event and safeguarding City Hall was of utmost concern to the organization. Action: Pinnacle Communications was selected based on our experience at the venue, our client references, and our ability to deliver quickly and efficiently under budget. Pinnacle provided ambient lighting, video projection, and staging for an audience of 400 plus. Result: The event was a complete success. Many politicians, journalists, heads of business and labor, and community leaders gathered to celebrate and enjoy the evening. Pinnacle Communications, behind the scenes, was in full view enhancing the event. "Thank you so much for everything Pinnacle Communications provided for us. We could not have been more pleased."